If you had skill with the tennis racquet and had John Moss as your coach, your chances of playing at the college level were excellent. For 32 seasons, John Moss coached tennis at Pekin High School, and his success rate was truly amazing: 19 district titles, four Big 12 conference titles, eight Illini Conference crowns, six Mid-State 9 championships, and a dual meet record of 471-105 with six undefeated seasons. At the state tournament level, his teams were second in 1951, third four times, fourth four times and fifth once. 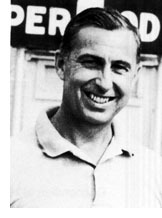 Individually, he produced state doubles champions four times, and for 17 consecutive years had had players on the University of Illinois varsity. Two of his players, Doyle Glass and Joe Epkins, captained the Illini while many others played at other schools, including Purdue and Bradley. Karl Wilson was the NAIA national tournament runner-up. He was also an assistant coach in football and basketball for many years. One of his 12 frosh-soph basketball teams went 21-0, while his frosh-soph football teams were 69-12 with five undefeated seasons. He also served as Pekin athletic director in the 1955-1964 period. 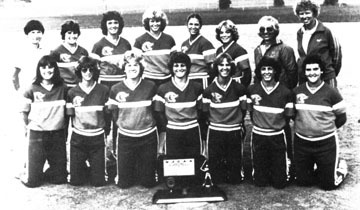 BACK ROW (L to R): Karen Guthmiller, Leslie Miller, Paula Buscher, Cyndi Huffman, Julie Conway, Deanna Hacker, Laurie McDonough, Coach Lorene Ramsey. FRONT ROW (L to R): Stacy King, Julie Compton, Caryl Moehring, Julie Micheletti, Jan Christiansen, Lisa Cantor, Ken Hanson.